Definition at line 76 of file lscript_library.h. Definition at line 239 of file lscript_library.h. Definition at line 243 of file lscript_library.h. References llendl, llerrs, mKey, mString, and NULL. Definition at line 267 of file lscript_library.h. References bytestream2char(), bytestream2float(), bytestream2integer(), bytestream2quaternion(), bytestream2vector(), llendl, llerrs, LST_FLOATINGPOINT, LST_INTEGER, LST_KEY, LST_LIST, LST_QUATERNION, LST_STRING, LST_VECTOR, mFP, mInteger, mKey, mQuat, mString, mType, mVec, NULL, and TOP_OF_MEMORY. Definition at line 380 of file lscript_library.h. Definition at line 384 of file lscript_library.h. Definition at line 388 of file lscript_library.h. Definition at line 394 of file lscript_library.h. References llendl, llerrs, mString, and NULL. Definition at line 413 of file lscript_library.h. Definition at line 432 of file lscript_library.h. Definition at line 436 of file lscript_library.h. Definition at line 440 of file lscript_library.h. References mKey, mListp, and mString. Definition at line 161 of file lscript_library.h. References FALSE, LST_LIST, mListp, mType, and TRUE. Referenced by lsa_get_data(), and lsa_heap_add_data(). Definition at line 149 of file lscript_library.h. Referenced by lsa_bubble_sort(), lsa_cmp_lists(), lsa_create_data_block(), lsa_heap_add_data(), lsa_insert_data(), and lsa_randomize(). Definition at line 173 of file lscript_library.h. References LST_FLOATINGPOINT, LST_INTEGER, LST_KEY, LST_LIST, LST_QUATERNION, LST_STRING, LST_VECTOR, mKey, mString, mType, S32, and size. Definition at line 512 of file lscript_library.cpp. 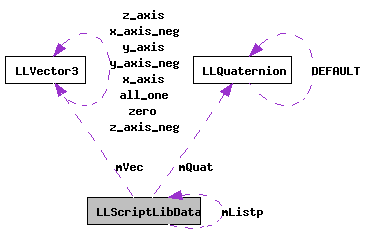 References LST_FLOATINGPOINT, LST_INTEGER, LST_KEY, LST_QUATERNION, LST_STRING, LST_VECTOR, mFP, mInteger, mKey, LLQuaternion::mQ, mQuat, mString, mType, LLVector3::mV, mVec, VS, VX, VY, and VZ. Definition at line 549 of file lscript_library.cpp. Definition at line 316 of file lscript_library.h. Definition at line 368 of file lscript_library.h. References llendl, llerrs, LST_STRING, mString, mType, and NULL. Definition at line 207 of file lscript_library.h. References char2bytestream(), float2bytestream(), integer2bytestream(), LST_FLOATINGPOINT, LST_INTEGER, LST_KEY, LST_LIST, LST_QUATERNION, LST_STRING, LST_VECTOR, mFP, mInteger, mKey, mQuat, mString, mType, mVec, quaternion2bytestream(), S32, and vector2bytestream(). Definition at line 89 of file lscript_library.h. Definition at line 117 of file lscript_library.h. Definition at line 82 of file lscript_library.h. Referenced by LLScriptLibData(), lsa_create_data_block(), lsa_get_data(), lsa_insert_data(), lscript_pop_variable(), lscript_push_return_variable(), lscript_push_variable(), lscript_stacktol_pop_variable(), print(), print_separator(), run_print(), set(), and write2bytestream(). Definition at line 81 of file lscript_library.h. Definition at line 83 of file lscript_library.h. Referenced by getSavedSize(), key_list_operation(), list_key_operation(), LLScriptLibData(), lsa_cat_strings(), lsa_cmp_strings(), lsa_create_data_block(), lsa_get_data(), lsa_heap_add_data(), lsa_insert_data(), lscript_pop_variable(), lscript_stacktol_pop_variable(), print(), print_separator(), run_print(), set(), write2bytestream(), and ~LLScriptLibData(). Definition at line 87 of file lscript_library.h. Referenced by checkForMultipleLists(), getListLength(), lsa_bubble_sort(), lsa_cat_lists(), lsa_create_data_block(), lsa_get_data(), lsa_get_list_ptr(), lsa_insert_data(), lsa_postadd_lists(), lsa_preadd_lists(), lsa_randomize(), lscript_pop_variable(), lscript_stacktol_pop_variable(), LLScriptSAList::recurse(), run_print(), run_stacktol(), and ~LLScriptLibData(). Definition at line 86 of file lscript_library.h. Definition at line 84 of file lscript_library.h. Referenced by getSavedSize(), key_list_operation(), list_key_operation(), LLScriptLibData(), lsa_cat_strings(), lsa_cmp_strings(), lsa_create_data_block(), lsa_get_data(), lsa_heap_add_data(), lsa_insert_data(), lscript_pop_variable(), lscript_stacktol_pop_variable(), print(), print_separator(), run_print(), set(), setFromCSV(), write2bytestream(), and ~LLScriptLibData(). Definition at line 80 of file lscript_library.h. Referenced by checkForMultipleLists(), getSavedSize(), key_list_operation(), list_key_operation(), LLScriptLibData(), lsa_cat_lists(), lsa_cat_strings(), lsa_cmp_lists(), lsa_cmp_strings(), lsa_create_data_block(), lsa_get_data(), lsa_heap_add_data(), lsa_insert_data(), lsa_postadd_lists(), lsa_preadd_lists(), lscript_pop_variable(), lscript_push_return_variable(), lscript_push_variable(), lscript_stacktol_pop_variable(), print(), print_separator(), LLScriptGlobalVariable::recurse(), LLScriptSAList::recurse(), LLScriptExecute::run(), run_calllib(), run_calllib_two_byte(), run_print(), run_stacktol(), set(), setFromCSV(), and write2bytestream(). Definition at line 85 of file lscript_library.h.